Calling All Women In Exhibitions! This year, we’re planning two ways to make our 2018 EXHIBITORLIVE show experience more accessible and meaningful than ever before. You will not want to miss out on these opportunities to discuss challenges and success strategies, network with peers, and make new contacts you can count on. Join your female colleagues in the Exhibition and Event industry at this breakfast meeting on Tuesday morning, February 27, from 8-10 am at Border Grill (Mandalay Bay). Breakfast and roundtable discussions focused on topics such as Vocalizing Your Need for Respect, Wage Gap and Negotiating, Work/Life Balance for Working Moms are sponsored by MirrorShow Management, AccessTCA, and Design Factory. Our special guest speaker Lynette Xanders of Wild Alchemy will address female leadership and entrepreneurship (sponsored by Pinnacle Exhibits). Graphic printing by Five Inc.
Special thank you to EXHIBITORLIVE for the booth space to promote Women In Exhibitions! If you have questions, please contact me (Katina Rigall Zipay) at Katina@classicexhibits.com. I look forward to seeing you at the breakfast and on the show floor. Clearly a non-native speaker wrote the copy. I understand that. I do. 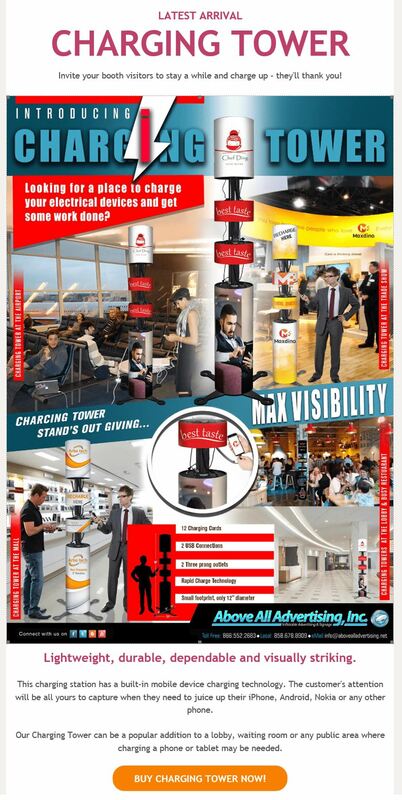 However, it doesn’t excuse AboveAll Advertising from using it “as is.” And then there are the graphics (Yikes!). I’ll leave that to the graphic design professionals to critique. BTW — Can you still buy a Nokia phone? You’ve proposed a Gravitee One-Step Modular design to your client. They are interested. Actually very interested because you’ve explained how much they’ll save on shipping, labor, and drayage over a traditional hybrid or European modular system (as much as 40%). Now they want details. You can show them the Gravitee Literature or even a quick video, but nothing compares to a Gravitee sample panel. In seconds, they get it, and they’re ready to move forward. 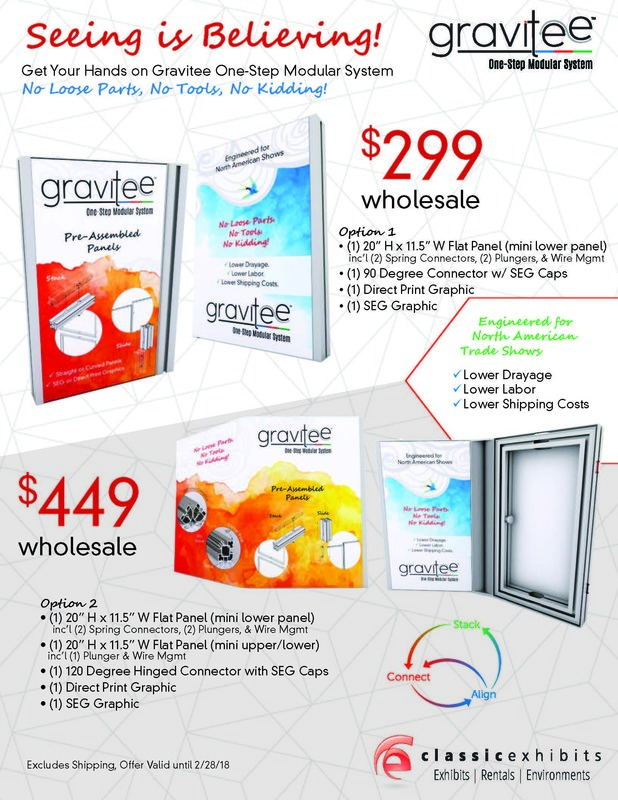 See below for two amazing offers on Gravitee Sample Kits. Both at GOTTA HAVE Prices! Send your P.O. today to projects@classicexhibits.com (offer valid until Feb. 28). I am fascinated by personal branding as a marketing strategy. And it’s not as if it is a new concept. In its most basic form, it’s just Public Relations. What has changed is the democratization of branding with the Internet and Social Media. We all follow and/or connect with people who have established a personal brand. Some are famous. Some semi-famous. Others are part of our business or social circle. Recently, I asked Erica Dougherty, an Account Executive at Exhibits Northwest Seattle, about her strategy of personal branding. From the photos, you can tell it’s distinctive, creative, and memorable. It’s also genuine as you’ll discover in the interview below. Who is Erica and where did that pink hair come from? Obviously, the hair is natural! No really… it is. It should just grow out of my head this way, but it doesn’t, so I help it out “a little.” I am a designer by education/past life, with a Bachelor’s Degree in Graphic Design, so I’ve always been dialed into trends and design-life. Sales and Marketing are both large parts of my background in various forms and should work in tandem. Social media, quite obviously, has forced us all to be personal branding experts; we all do it whether we mean to or not and it can be for the good of our personal brand… or not. Intentional self-branding must be strategic, but I won’t pretend that my own was strategic: it sort of happened organically. When my hair became fully pink (it was a gradual transition), it wasn’t as popular of a trend as it is now. I would show up to networking events, and it seemed to be how people naturally remembered me from one event to the next. That was my ah-ha moment — the Pink Hair is a part of ME now. Might as well use it to my advantage! How have you used your identity to your benefit in the business of trade show exhibit sales? I’m definitely more than my pink hair. Some would say I have a big personality too. I’m truly an extrovert, ready to talk to anyone. I suppose I’m easily approachable because I tend to make friends where ever I go. It drives my husband crazy sometimes. However, I believe successful salespeople should be memorable in some way, something positive that people remember about them that makes them unique. The pink hair concept just found me and it works. 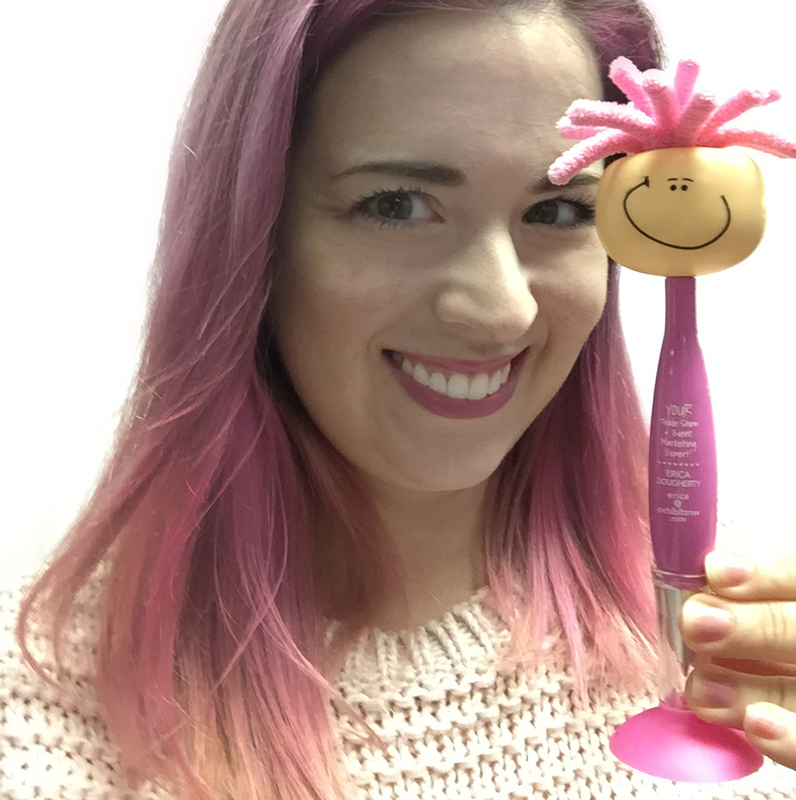 The whimsical pink hair is paired with my friendly, professional, and authentic self, thus (hopefully) it doesn’t seem unbusinesslike. It’s all about balance. But being a little out-of-the-box does help specifically in our industry. Trade show exhibits are NOT something an individual really ever needs (like insurance, for instance), and not something companies purchase every day. 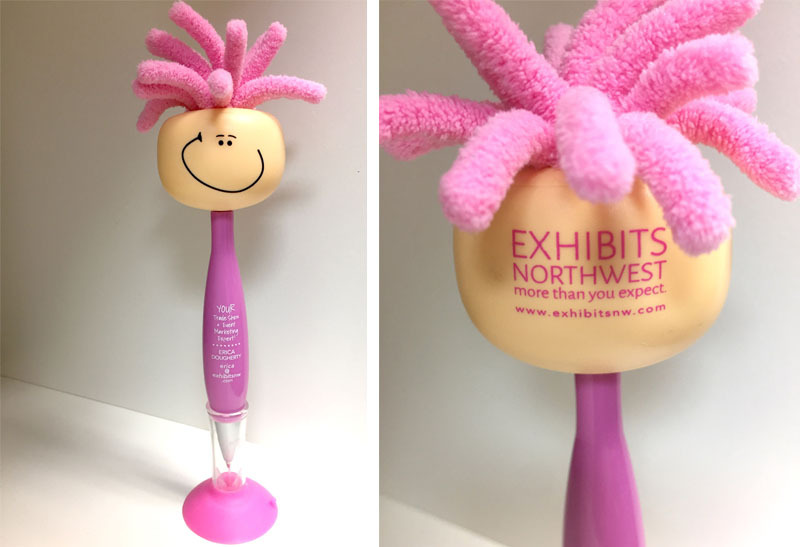 It is my job to be sure that if there’s someone in Seattle tasked with sourcing a new trade show exhibit for their company, that they think, “Oh, I know someone!” and give me a call at Exhibits Northwest. So, HOW do you guarantee you are top-of-mind and easy to contact? Repetition, knowledge, memorable appearance and obviously, a bobble-head pen with my contact info on their desk! So what is your strategy to be top-of-mind? For the first year of in-person marketing efforts, I have be actively engaged in local Seattle networking events and groups. People remember me from event-to-event (and I remember them… that’s super important too!). Thus I am slowly infiltrating their memory and instilling a positive perception of Exhibits Northwest. Some new business has resulted from my efforts, in addition to event marketing opportunities and community sponsorships in 2018. Each of these is an opportunity to be in front of hundreds of local business representatives. Ironically, much like that face-to-face relationship building that trade shows provide. Late 2017, my strategy evolved finally when I began planning for my first “Lunch + Learn” and wanted something as a leave-behind. The answer was on my desk for a year — a swag silly bobble-head pen given to me by a wonderful client (from a trade show). The blue pen with a giant smile and orange troll-doll hair sat on my desk for about a year, making me smile. It’s just weird and funny, especially coming from my client, QCash Financial. Yep, a silly bobble-head pen from a digital lending company. Seattle’s WeWork locations (which are full of growing new businesses, likely many never or novice trade show exhibitors) are perfect locations to start my Trade Show Marketing 101 Lunch + Learns. I really enjoy working with Trade Show newbies and helping them find success. What I needed was a fun, memorable and personal take-away, a small token of thank you swag. I brainstormed ideas, but then it hit me. I should give out a mini-ME, pink hair and all. Each time I give one out, I am sure to say, “It’s ME!” Hopefully, she’ll sit on your desk, waiting for that moment when the trade show booth is registered and the “What’s next?” happens. Me. I’m next. Call me. I’m your trade show support, ready to help! First quarter 2018 is already filling up with scheduled Lunch + Learns in Seattle, plus other networking events. I’ll toss a few pens in my bag and go! It’s all about awareness, so my continued goal is repeating Exhibits Northwest in conversation, being me, and getting a mini-me pen on as many desks as I can! (Well, my first order was 150 pens, so we’ll start there!) These pens are certainly not the quick answer to gaining tons of new business… but they certainly make the process more fun. Thanks Erica. How can you to contact Erica, whether you need a banner stand or custom island exhibit? You can reach her at www.exhibitsnw.com or erica@exhibitsnw.com. You can also find her at her LinkedIn page (https://www.linkedin.com/in/erica-dougherty-7431ab110/). You’ll recognize the distinctive pink hair. If you are in the trade show business, as a designer, builder, marketer, general contractor, etc., you often get a puzzled look when someone asks, “What do you do?” It can be frustrating, particularly if the person asking has never attended a large trade show (as opposed to a home and garden show or craft fair). Now imagine you are a Classic Exhibits employee. How frustrating would it be to get that same question from a Classic Exhibits Distributor. 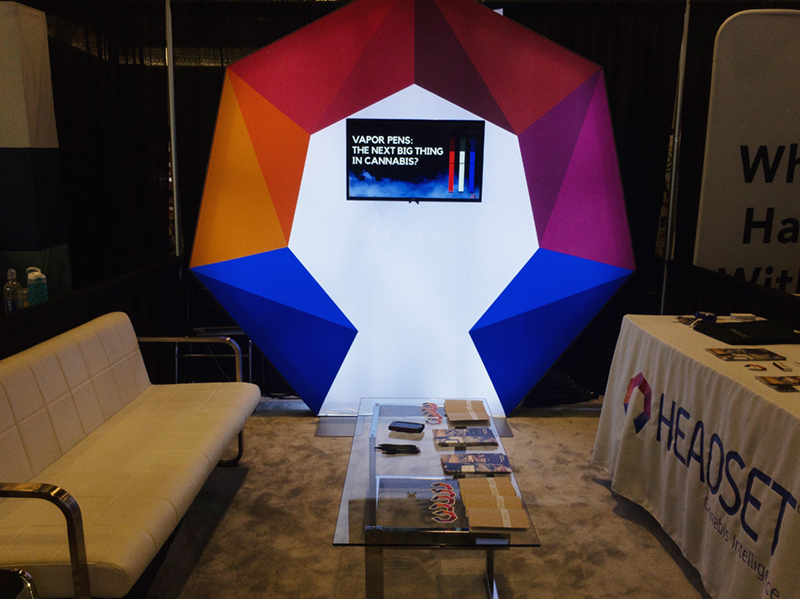 For example, “Don’t you build portable hybrid displays?” Yes we do… but we also build custom modular, custom, iPad stands, charging stations, LED lightboxes, and even hanging signs. We design and build what you ask us to build. Sometimes it’s a table top, but more often, it’s a highly customized display for a trade show, retail store, event, or corporate environment.